The following is an account of the visit of a high school friend from Australia. Although we have kept in touch over the decades, this was the first time we had done any traveling together, so it was a privilege to share with her this wonderful country in which I now live. Today I drove to the Tucson Airport to meet Pat who was flying in from Australia via Los Angeles. I turned the odometer back to 0.0 ready to record the mileages during Pat’s visit. I was watching for Pat’s arrival on the TV screen and saw her so went to the elevator, but she did not show up. I found her by the carousel waiting for her luggage! We left the airport at 3:50 and arrived back at the house by 4:25. Pat lost one of her crowns and I was able to get a morning appointment for her at Gentle Dental. After lunch I drove over to a neighbor for Pat to see the quilting class and meet some of my friends. Then we drove over Picture Rocks Road to Saguaro National Park where we enjoyed the video and the following view of the Sonoran desert when the screen went up and the curtains opened. From here we drove to the Old Tucson Studios before returning home via Gates Pass and Silverbell Road. Today it was decided that we would go up Mount Lemmon 9,157 feet (2,791 m ) so Pat could see the contrasts of the area from the Sonoran Desert to the pine clad mountain. First we drove to the Post Office on Thornydale for Pat to get stamps for the post cards she wanted to send to Australia then headed across town to the Catalina Highway. From here we drove up the Sky Island Scenic Byway, starting with the desert and rising through grasslands and hardwood forest to the pines. Along the road are numerous pullouts allowing for views of the area. In some places you can look down on the winding road below and at others the railing and reinforcement of the road above. The myriad rock formations along the road are always of great interest. We had coffee and dessert at the Iron Door Restaurant. The restaurant and the ski valley are usually at the end of the road but today the gate which indicates the end of the road was open and cars were both going and coming back through the road. I decided to explore what lay beyond and was able to continue climbing for another two miles along a winding road. Beautiful yellow columbines were blooming on the embankments as well as some bright red flowers. It was 7 o’clock when we arrived home. We went to church this morning and Adult Sunday School following the service. We stopped in at Kohl’s and Payless Shoes to do some shopping on the way home. The rest of the day was for relaxing. In the evening Pat took LP and me out for dinner at El Corral, LP’s favorite restaurant. The plan today was to visit the San Xavier Mission, but because Pat was so interested in Arizona’s copper production I decided to drive south to Green Valley so she could see where some major mining was being done. mine tailings which showed the extent of mining being done in the area. It was also exciting to see the variety of colors in the blooms of the barrel cactus. From here we returned to the Interstate and went south to Green Valley looking for the Pecan orchards, the largest irrigated pecan orchard in the world. I was given bad directions and finished up driving through Duval and back to Sahuarita where we had a $2.00 lunch at Denny’s. This was in a mall where Pat was able to do some shopping! From here we were able to find the pecan orchard and visit the Green Valley Pecan Company store. After this it was back to the highway and north to the San Xavier Mission where the heat of the day was particularly noticeable, 109°F (43°C). We returned home via Mission Road, a brief detour to Sentinel Peak, locally known as “A” Mountain, and Silverbell Road. Today we ran a few errands, going to Walgreen’s and trying to renew my prescription at FRY’S before going to FRY’S Marketplace on Tangerine. I wanted to get gas here with my 30¢ per gallon discount ready for our trip. We also did our main shopping here procuring supplies for our meals along the way. Pat and I left the next morning for our trip north through a number of National Parks in the United States, up through the Canadian Rockies and on to Vancouver..
We managed to leave home shortly before 9 o’clock. I had turned the odometer back to 0.0 for the start of the road trip so I can see our total distance as we go along, but will convert the miles to kilometers for Pat’s records. We took a break at the Rest Area along Interstate 10 and another 20 minutes later at a McDonald’s where we could get coffee. 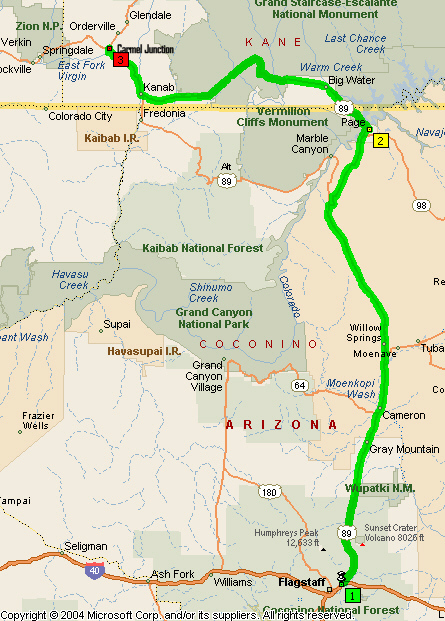 We did not stop again until we were well through Metropolitan Phoenix and pulled into the Sunset Point Rest Area. We also had our lunch here. Less than an hour later we turned off the highway onto Red Rock Scenic Byway to Sedona. We spent half an hour at Red Rock Visitor Center before proceeding into Sedona. Our first stop after this was Chapel of the Holy Cross, an amazing structure built into the cliffs. Driving along the main street through Sedona we made a brief stop in an area behind some of the shops. From Sedona we drove along Oak Creek Canyon, traversing the canyon floor for about thirteen miles before climbing the canyon wall via a series of hairpin bends. We spent half an hour at the summit, Oak Creek Vista, with wonderful views of the canyon as well as the road making its way up the canyon wall. Although we arrived in Flagstaff around 4:20 it was nearly half an hour before we found the motel we wanted, the Best Western Pony Soldier Inn & Suites. Today we got an early start, but filled up with gas before leaving Flagstaff and only made one stop at a scenic viewpoint before our coffee break at McDonald’s in Page. It was a glorious day and exciting to see the rich color and all the various formations in the cliffs. On our way out of Page we stopped for pictures of the Historic Navajo Bridge and a view of the Glen Canyon Dam. This bridge was the only crossing of the Colorado River for over 600 miles and was the main highway from Arizona to Utah. 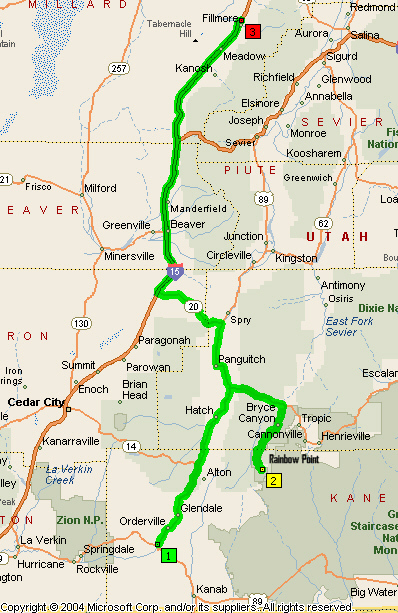 After entering Utah we made a brief stop in Big Water to get area maps and information. Both Arizona and Utah are in the Mountain Time Zone, but since Arizona does not have daylight saving time and Utah does so we lost an hour as it were! However, we would not have any more time changes until we were in the Canadian Rockies and heading into British Columbia. We had a ten minute break at McDonald’s in Kanab and stopped again just north of town for a picture of the lovely sign for the town and its logo “The Greatest Earth On Show.”. Another brief stop was made for pictures of the coral sands (we did not have time to detour through the coral sand dunes) and the distant cliffs. It was mid afternoon when we arrived at the Best Western East Zion Thunderbird Lodge where we were able to get a lovely room with interesting log furniture. We unpacked the car and had a late meal before setting out late afternoon for Zion National Park. We parked at the Visitor Center and from here we were able to board the Zion Shuttle which stops at eight different locations in the park - Zion Museum, Canyon Junction, Court of the Patriarchs, Zion Lodge, The Grotto, Weeping Rock, Big Bend and Temple of Sinawava. However, we were there so late in the day we simply rode the shuttle to the end of the line and back, and this was not conducive to taking a lot of photographs! On the way back to the motel, after exiting the 1.1 mile long tunnel, completed in 1930, we had the good fortune to see several Bighorn Sheep. Then after leaving the park some lovely log cabins with horses in the foreground had a beautiful glow in the evening light. It was almost 8 o’clock when we arrived back at the lodge. This morning we had a late start in that we dallied to take pictures, browse in the gift shop and got gas. Once we turned off on UT-12 to go to Bryce Canyon National Park it was slow going. There were a number of pullouts along the road as we approached and drove through Red Canyon and we couldn’t resist stopping to take pictures of the red cliffs and the amazing formations. Nor did we miss see a few wildflowers. It was 11:30 by the time we reached the entrance to the National Park, where we were held up wanting a picture of the sign without people in it. Most everyone wants to be in their picture of the sign! The entry fee for the park of $25.00 was waived because of my pass. We spent 20 minutes at the Visitor Center, then stopped for lunch in one of the picnic areas. Chipmunks were scurrying around hoping a morsel would come their way! Whilst we were here we thought that we could hear thunder in the distance and some black clouds were appearing in the sky. During the 10 minutes at Sunrise Point there was more thunder and dark clouds were gathering overhead. We could also look out from the viewing area and see where rain was falling. 5 minutes at Natural Bridge, elevation 8,627 feet. Natural Bridge is a misnomer because it really is an arch. Bridges are carved by rushing streams whereas this opening has been carved by other forms of weather. 3 minutes at Ponderosa Point, elevation 8,904 feet. The sky became very dark and it started raining in earnest. It was very interesting how the colors in some of the cliffs seemed to glow in spite of the adverse weather conditions. 8 minutes at Rainbow Point, elevation 9,115 feet. The rain was just pouring down and the small shelter here was inadequate for the number of people! And on our way back 3 minutes at Black Birch Canyon, elevation 8,750 feet. As we descended from the high point we were surprised to find the shoulder of the road and surrounding area white with hailstones which had fallen at the height of the storm. A little further down we saw the two pronghorns we had seen on our way up. Also at one point we had to stop for a number of trail donkeys which were being led across the road. Before leaving the park we spent another 10 minutes at the Visitor Center, and took a few minutes for pictures in Old Bryce Town. On our way into the park Pat had noticed a sign for a wildlife museum. Paunsaugunt Wildlife Museum, which houses 450 animals, 1500 butterflies plus birds and fish was such an interesting place that we could easily have spent more than the 40 minutes we were here. The Paunsaguant Wildlife Museum has become one of the finest wildlife museums in the country all because of one man’s desire to make his dream a reality. Robert Driedonks, museum curator and owner of the Paunsaugunt Wildlife Museum, is living his dream, the dream of leaving a legacy that will continue to educate people about wildlife. He has spent the last 42 years of his life hunting and collecting animals from all over the world to create a museum with exhibits dedicated to preservation, accuracy, and education. Robert admits that since the age of 16 he has known that a wildlife museum would be his destiny. Amazing as the new museum is Robert still has future expansion plans. There are still 50 animals that won’t fit. His future goal is to add 10,000 more square feet to house the total animal collection. 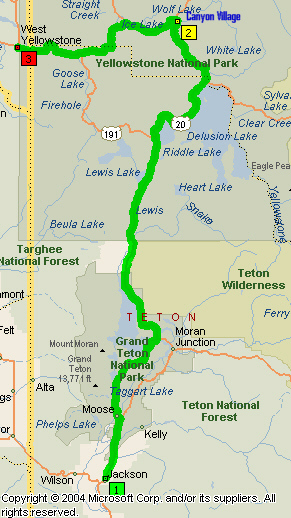 It was after 5:30 when we reached the junction with US-89 which we took north through Panguitch to UT-20. From here we drove west to the interstate, I-15, then north to Fillmore, arriving at the Best Western Paradise Inn at 7:15. Since there was a restaurant on site we decided to have dinner there - not good! I foolishly ordered prime rib, which was so tough I could not cut it let alone chew it!! The waiter took it away to cut it into pieces for me (I was having trouble with strength in my wrist) and he had trouble too, so we were not charged for the meal. Today we only had just under 150 miles from the Paradise Inn to our destination, so did not have to rush to get on the road and I enjoyed looking at the garden at the motel. Along the way we took a coffee break in Springville and also filled up with gas. It was just 1:15 when we arrived at the Best Western Plus Airport Inn & Suites. Unloading the car I realized that I had left the transformer for the cooler in our room in Fillmore. I was very distressed about this and wanted to drive back to Fillmore for it. This was the first time since Pat’s arrival that we did not see eye to eye and some harsh words were exchanged! A phone call was made to Fillmore, and yes they had found the transformer and could ship it overnight, but not until Monday. 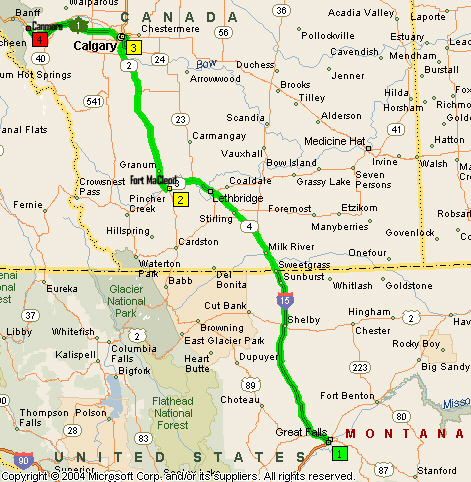 After much deliberation and a number of phone calls we booked a motel in West Yellowstone for the Tuesday night and arranged for the shipment to that hotel. In the meantime we were able to put our food in our room refrigerator, and just had to trust that the package made it to West Yellowstone motel for when we arrived. In between all this fuss and making the arrangements, we settled into the room where we were to spend two nights and had some lunch. Just after 4:30 we left for a drive to Saltair. The place looked deserted and completely closed up, so we continued west to the Great Salt Lake State Marina where there was some activity and lots of boats. After this I drove into town past Temple Square and around the State Capitol, but decided to leave most of the sightseeing for the next day so returned to the hotel. 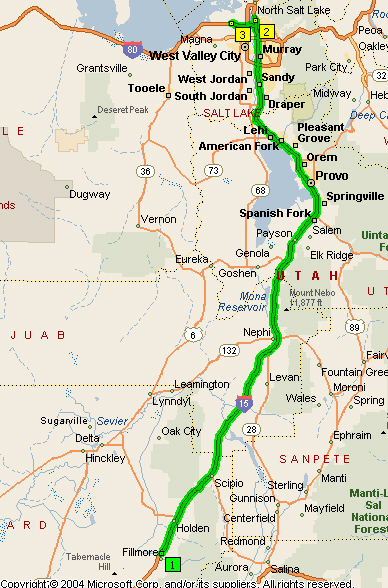 One of the differences I did notice since my last visit to Salt Lake City was the addition of a rail transport system. Contrary to my thoughts, Pat felt that I deserved a rest from driving and decided we should find alternative transportation into the city and do a city bus tour. In vain I objected! With no shuttles to the city or to the airport a taxi was booked. The attendant at the motel thought it would only be about $10.00, but turned out to be, along with the tip, $27.00. Later in the day it would be $25.00 for the return trip to the hotel. The taxi dropped us off at The Cathedral of Saint Mark Episcopal Church and we attended the 10:30 service. St. Mark's Episcopal Cathedral located at 231 E. 100 South in Salt Lake City, Utah is the cathedral church of the Diocese of Utah in the Episcopal Church in the United States of America. Built in 1871, it is the third oldest Episcopal Cathedral in the United States and the oldest continuously used worship building in Utah. It was designed by noted architect, Richard Upjohn, in the Gothic Revival style. After church we walked to the Visitor Center to inquire about the bus tours, but decided to have lunch first and returned to the Cheesecake Factory Restaurant which we had passed on our way from church and where we enjoyed a lovely meal. We also decided to attend the 2 o’clock Organ Recital at the Tabernacle and walked from the restaurant through City Creek Center, a retail centerpiece in the heart of the city. This shopping center features a retractable glass roof, a creek that runs through the property and a pedestrian skybridge. On the way to the tabernacle we enjoyed the beautiful gardens through Temple Square. Back at the Visitor Center we bought our tickets for the bus tour - seniors $27.00 each. As it was the last tour of the day we could not take advantage of alighting at the various stopping points along the way. Also as it was a Sunday we missed out on the free lunch at the Lion House, the historical home of Brigham Young. We didn’t enjoy the bus tour very much as the bus was most uncomfortable and most of the seats were in the hot sun. The tour took us pass a number of Salt Lake City attractions, but, as in Zion, the trip was not conducive to taking photographs. Back downtown we tried to find a bus which would take us back to the hotel, but were forced to signal a cab. It was after 10 o’clock by the time we packed the cooler, hauled everything downstairs and got on the road. 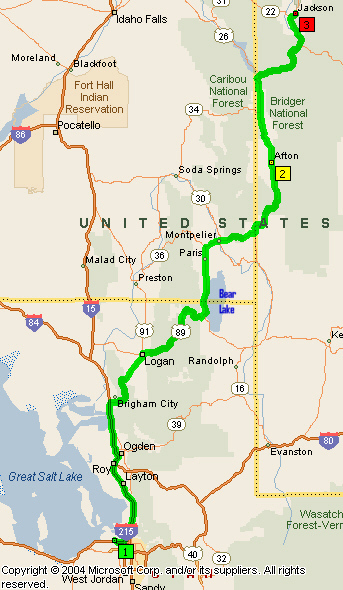 We went east on Interstate 80 to Interstate 15 then north to Exit 362 for US-89 to Logan. We had a coffee break in Brigham City soon after leaving the interstate and before going onto Logan and through Logan canyon. US-89 is a Scenic Byway which parallels the Logan River through the canyon with its rugged rock formations. Then, cresting at Bear Lake Summit, elevation 7,810 feet we descended to Bear Lake Overlook and Rest Area with a distant view of the surrounding area and Bear Lake in the valley below. We had our lunch here. A long descent from the overlook brought us to Bear Lake and US-89 followed the shoreline for some distance, a very pretty drive. We noticed a beautiful building in Paris, the Church of Latter day saints Paris Tabernacle which was erected in 1888, and paused for a picture. Our next stop was in Montpelier to replenish our supplies at Broulim’s Supermarket. We made several other brief stops along the way, one for a couple of minutes so Pat could get pictures of cows and horses. This was just before entering Smoot, population 100, elevation 6,619 feet. It was 79° in Afton where we stopped for the antler arch over the road. We had to get gas in Thayne and arrived in Jackson at 6 o’clock. The Super 8 had no vacancies so we continued further into town. The sign for the Virginian Lodge caught my eye and rooms were still available at this historic establishment. After settling in and having a meal I went for a short walk by the pool area and loved looking at all the colorful petunias in the beautiful hanging baskets. We left the Virginian Lodge just before 8:30 and entered Grand Teton National Park less than an hour later and Yellowstone National Park an hour and fifteen minutes after that. Although we made numerous stops en route to take picture of the mountains, glaciers and lakes, the air quality was poor or there was a haze in the valley. It had been a number of years since visiting Yellowstone and it was great to see the forest returning. West Thumb on the shore of Yellowstone Lake with its surface elevation of 7,733 feet, provided our first view of a geyser basin. The boardwalk gave us a closeup look at the thermal features - steam from the boiling waters and hot bubbling mud pots. We had our lunch at a picnic table under the pines before leaving. From West Thumb we drove through Lake Village and along the Yellowstone River through Hayden valley, pausing at Sulphur Caldron and enjoyed observing bison as they meandered across the road. We turned off the main route to see the colorful canyon of the Yellowstone River and viewed Upper Falls, Artist Point and Lower Falls. We had a reservation at the Best Western Crosswinds Motor Inn and arrived here at 5 o’clock. We were pleased that the package with my transformer had arrived from Fillmore. This morning after leaving the motel, getting gas, checking out some stores and taking a few pictures, we headed back into the National Park covering some of the road we had done yesterday as far as Norris. Here we turned north to Mammoth Hots Springs and on to Gardner. Although we did not stop in Mammoth the area seemed to have changed a lot since I was last here and the terraces did not appear to be as vibrant. However, I would need to explore the area better to know what is happening! Before leaving the park we were pleased to see some wildlife, namely some mountain sheep. They were grazing near the river at the side of the road. Leaving Yellowstone National Park at the North Entrance we drove through the Roosevelt Arch. In Gardner we spent some time at the Visitor Center and gift store and I checked the map to decide on the best route to Great Falls, US-89, the continuation of the route we had taken in Arizona when leaving Flagstaff. Once again, after leaving Gardner, I stopped to photograph Montana’s Devils Slide. Just before getting into Livingston, and close to the road, we saw some beautiful horses which Pat was able to photograph. A couple of minutes later we were in the city. Finally!! McDonald’s and a cup of coffee! 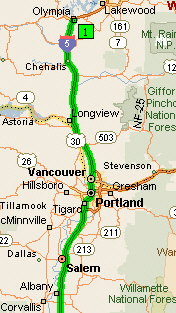 Immediately after this US-89 joined the freeway, I-90 east until Exit-340, where it continued north. Having had a late coffee, we decided on a later lunch which we had in Veterans Park in Wilsall. Some time after this the highway entered the Little Belt Mountain Range, the Little Belts as they were referred to, which afforded some beautiful scenery. The highest point we crossed was Kings Hill Pass, elevation 7,393 feet and at one viewpoint we could look across to the Showdown Ski Area, the slopes of which range between 7000 and 8200 feet. We paused briefly several times in our journey, once in a small town where there was a small Methodist Church, also a cemetery tucked away in the woods on the side of a hill, again at a scenic viewpoint and later a Rest Area at the junction of US-89 with US-87. We were able to get a room at the Best Western Plus Heritage Inn in Great Falls, a huge complex and not particularly friendly. We bought gas in Great Falls before getting onto the interstate north to Canada. A brief stop was made in Shelby for Pat to mail a postcard, then it was on to the border. I got goose bumps driving into Alberta and looking at all the information at the Milk River Welcome Center. It was a reminder of how much I had enjoyed living in Alberta! Coffee at McDonald’s was the first item on the agenda when we got into Lethbridge. Then within minutes we found the Information Center where there was a picnic park and we could have our lunch. After this we had one of our longest drives, the aim being to reach the outskirts of Banff National Park today. We only made one stop before reaching Canmore and that was in Calgary to fill up with gas. We left the highway to drive through Canmore looking for suitable lodging and found the Rocky Mountain Ski Lodge. This was very acceptable as it was roomy and even had a kitchenette and dining area. Before setting out for the day we decided to check out the French restaurant which had been recommended to us, Chez Francois, and had Eggs benedict for breakfast. We returned to the lodge to pack our things and the car, then went to Safeway to replenish our supplies for the next few days. Leaving Canmore it was just a short distance before entering Banff National Park. My US Park Pass could not be honored in Canada and the fee was $16.60. It was almost 11:30 when we found a parking spot one street back from Banff Avenue and from here we were able to walk through a small arcade. Right there was a coffee shop which served the best coffee ever. Then we took a few pictures on the main street and browsed in a gift shop before returning to the car. I drove up to the famous Banff Springs Hotel, then to the top of the Mount Norquay road which offered panoramic views of Banff and the valley below. After coming down from Mount Norquay we joined the Trans Canada Highway driving west to Castle Mountain and Lake Louise. I was most interested in the overpasses which were obviously for the wildlife inhabitants. Banff National Park offers one of the best opportunities to study the effectiveness of wildlife crossings because the park contains a wide variety of species and is bisected by a large commercial road called the Trans-Canada Highway. To reduce the effects of the four-lane highway, 24 wildlife crossings (22 underpasses and two overpasses) were built to ensure habitat connectivity and protect motorists. Arriving in Lake Louise the parking lots were pretty full and there were people everywhere. We walked down to the lake and back to the car, where we stood and ate our lunch. Soon after leaving Lake Louise we ran into a lot of road construction, then crossing the border between Alberta and British Columbia we entered the Pacific Time Zone thus gaining an hour. The border is also the boundary between Banff and Yoho National Parks as well as being the Continental Divide, which runs the length of the North American Continent. There is a large pullout for viewing the Spiral Tunnels and a very informative display explains the engineering involved in the building of the railroad and the spiral tunnels. I couldn’t believe how many dying or dead trees there were in the area. The pine beetle infestation has taken a major toll on Yoho National Park. As of 2010, about 25% of the trees are infested. The needles turn red as they are attacked by the pine beetle and this adds a quite beautiful coloration to the landscape. Unfortunately they subsequently turn to barren dead wood. It is quite astounding to see an area set aside for preservation from the impacts of humans only to be destroyed by nature itself. Arrival in Revelstoke we went to the Information Center where we were given directions for accommodation and to Grizzly’s, an automotive repair shop. One of my tail lights had burned out and I did not want to be driving through mountains without it. We booked in for the night at Powder Springs Inn. Pat scouted out the place and we had dinner at Speeder's Pub in the hotel. We had a big day in front of us as my son, Stu, had said that Revelstoke to North Vancouver would take about eight hours! I pulled in briefly to 3-Valley-Gap where there was an interesting group of bright red roofed buildings. What caught my eye was the Western Red Cedar which has been estimated to been growing since 1126 A.D. A roof of the building has been built around the trunk of the tree. The Information Center in Sicamous would not be opening until 10 o’clock, so we went on to Salmon Arm by which time we pulled into Tim Horton’s for a coffee break. We bought gas nearby, then went to the Visitor Center in the Old Courthouse. It was 12:30 when we reached the Kamloops Visitor Center, where we had lunch at a picnic table in the sun overlooking the valley. After this we joined BC-5, known as the Coquihalla Highway, a 116-mile (186.7-km) long freeway, winding downhill with a posted speed of 110 km/h (68.4 mph). Fortunately there was one rest area along the way, the Britton Creek Rest Area, where we could walk around and stretch our legs for a bit. Then it was on to Hope and a half hour break at the Visitor Center before the two-hour run into Vancouver. It being the weekend the traffic was slow, but we made it to my duaghter’s and son-in-law’s, Anna and Walt, before 6 o’clock. This morning was a much quieter day after the long drive yesterday. We went to the 10 o’clock service at the Seymour United Church, but were not particularly impressed with what we heard. I also found it very different from the United Church I used to attend when living in Ontario and wondered if it was just this church or whether the church as a whole had changed so much! After church we did a few errand and got gas before returning to Anna’s.. We left later in the afternoon so as to arrive at Canuck Place ( http://www.canuckplace.org/ ) a little before 4 o’clock so we could see some of the activities going on there. Anna, Walt and family had been staying there for several days and they had invited us to eat with them. This gave Pat the opportunity of seeing Canuck Place and how wonderful it is for the families who are to spend time there. From Canuck Place I drove through the famous 1,000-acre Stanley Park, across Lion’s Gate Bridge and along Marine Drive to North Vancouver. I stopped by Stu’s and Holly’s just to say “Hello” as they had been away camping for the weekend. Anna and her youngest, Steve, returned from Canuck Place this morning and I spent the day with them. We dropped Pat off at the Seabus which she took into town and spent the day there. Pat called when she was back on the North Shore and she took us out to dinner at the Arms Reach Bistro overlooking Deep Cove. We sat at a table on the deck and this proved to be a little chilly, but the restaurant provides its patrons with blankets! Today Anna and Steve left for Osoyoos and I went shopping with Holly so Pat could have some quiet time and organize her things for moving for our last night in Vancouver. Since Stu’s and Holly’s house was under construction their neighbor, who was out of town very kindly let us stay at her house. We had dinner with Stu, Holly and their girls. We thoroughly enjoyed the lovely dinner they prepared, grilled wild salmon with mangoes and asparagus. Today would be the start of our trip south to Los Angeles but we were leaving Vancouver for another adventure before turning south. We went across town, through the tunnel under the Fraser River to Tsawwassen and took the ferry across Georgia Strait to Swartz Bay on Vancouver Island. The reason for this trip was to visit the world renowned Butchart Gardens which were created in an exhausted limestone quarry. We were able to spend three hours here strolling through these beautiful gardens before heading into Victoria where we had a reservation for a motel. The rose garden with so many varieties from around the world is magnificent. We didn’t leave the hotel until almost 10:30 but this gave us nearly three hours before we had to line up for the ferry to Washington. We parked downtown and found a coffee shop for morning tea before wandering through the historic Empress Hotel and along the waterfront. From downtown we drove to Beacon Hill Park for lunch and on the way passed by “Mile 0" of the Trans Canada Highway. After lunch we drove up Beacon Hill to the high point commanding a great view of Juan de Fuca Strait. Then it was time to line up for the Black Ball Ferry, the MV Coho, for which we had made a reservation the night before. We were asked questions by Customs officials and I had to take Pat’s and my passport for inspection before being allowed to board the ferry. For an ocean-going vessel to reach the age of 50 is quite an accomplishment. To span a career of over five decades under the same name, ownership and on the original service it was designed for is almost unheard of. Yet that is exactly what the M.V. COHO has managed to do. It is a ship perfectly suited to the daily ferry service it provides between Port Angeles, Washington and Victoria, British Columbia. In over 50 years, it has never missed a sailing and is as reliable today as it was at the time of it’s maiden voyage in 1959. We started to board the ferry twenty five minutes before sailing time and enjoyed a relaxed crossing of the Strait of Juan de Fuca, a distance of approximately 31 miles to Port Angeles, Washington. We disembarked in Port Angeles and had to drive through an Immigration station before going on our way. I had picked up a coupon book for motels in Washington, but we had thought of finding a place along the water as we drove south. However we drove into Olympia, Washington’s State Capital where we were able to use a coupon for a Quality Inn, arriving there at 8 o'clock, a late night for us!! 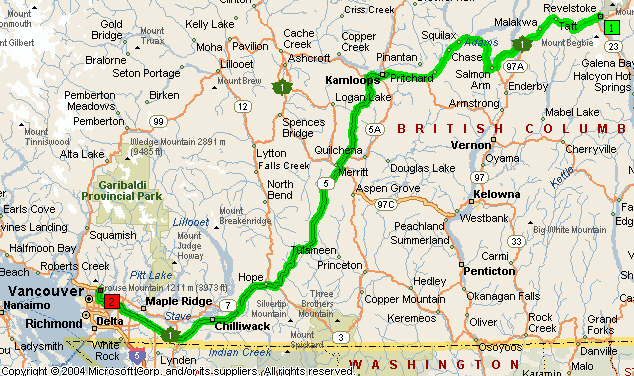 Our route today would be along Interstate 5 to southern Oregon with no specific sightseeing stops planned. I had forgotten to get gas before leaving Olympia and wanted to get it in Washington so stopped in Ridgefield. After Portland we were wanting a coffee break and left the highway at Exit 294 for Tigard. We went into Gator’s Pub and Eatery but they didn’t serve coffee here! Eventually we stopped at a McDonald’s and at 2 o’clock, half an hour after leaving there, we had our lunch at a Rest Area. We spent over an hour in Medford, first going to Harry & David’s, which is always a fun visit. We were also looking for an ATM and were sent to the Chase Bank at Fred Meyer! It was just before 6:30 when we arrived at the Rodeway Inn in Ashland. 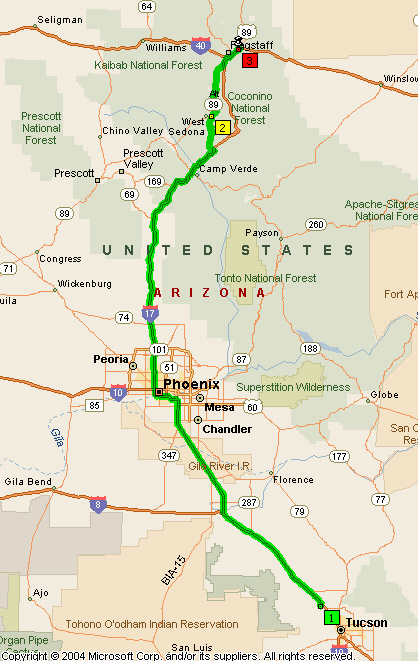 Today was the longest distance traveled in a single day since leaving Tucson. Today we made an earlier start, stopping for gas before leaving Ashland. Several stops were made during the morning, the first one being at the Shasta Valley Vista Point in California. Some major road construction is under way through the Shasta lake area and the speed greatly reduced. Thus I was able to capture a telephoto view of people camping at the water’s edge on a spit of land which normally would be under water. We had our morning coffee break at McDonald’s just before Redding, then spent about an hour in Corning, going to the Bank of America, Dollar Tree and the Olive Pit. Arriving at the Olive Pit later in the day rather than first thing in the morning or at the end of the day there was a full array of olive oils and other olive products set out for tasting. Our lunch stop was at a Rest Area just south of Corning and after this we had two hours and forty minutes of driving before arriving at our motel, Rodeway Inn, in Rohnert Park. The traffic became quite heavy on Interstate 80 before exiting onto CA-12, which was also slow both because of construction and because it was a two-lane road. We were in our room by 4:30 and Pat was able to phone her friends, John and Jill, and make arrangements for them picking her up the next day. Today Pat went out with her friends and I stayed at the motel all day! I have no record of distance traveled with friends! I filled the gas tank after checking out from the motel then we drove along Santa Rosa Avenue so Pat could show me some of the things she had seen with her friends. We were also looking for a Safeway where we could purchase the salad items Pat was taking to John’s and Jill’s for lunch, but found a Starbuck’s and had our morning coffee. We never did find Safeway, but were able to get everything we needed at Lucky’s Supermarket. It was 11:40 when we arrived at John’s and Jill’s. We had lunch with them, then Pat wanted to see their church as well as make John happy and take us to see a winery, the St. Francis winery in particular. John had opened a special bottle of St. Francis wine for lunch. When we returned to the house I thanked them for their hospitality and said my goodbyes, allowing Pat to go inside and have a bit of private time with them before we went on our way. We got on our way by 2:20, a later start than I had hoped for, so I made the personal decision to stay with the freeways out of San Francisco and not to start the coast road until after Monterey. This being the Monday of Labor Day weekend the traffic was not as heavy as I has expected, but did become more congested as we approached a tunnel before the Golden Gate Bridge. Whilst driving through a small tunnel north of the harbor it was very interesting to observe cloud rolling over the hill ahead and moving quite quickly. Before emerging from the tunnel we could see the supports of the Golden Gate Bridge soaring above the cloud. Quite a sight! 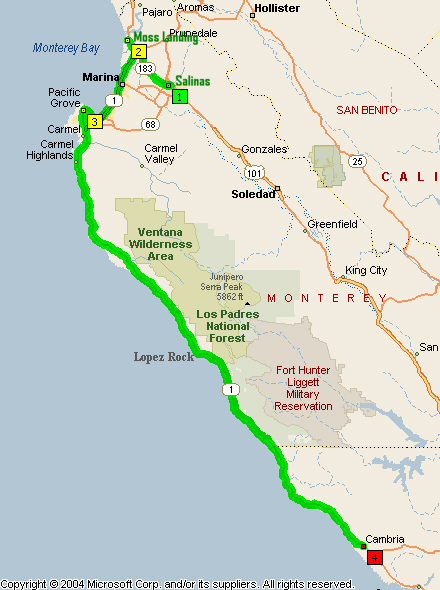 Although the traffic was busy we encountered no problems crossing the bridge nor driving through San Francisco and I just followed the signs for different highways until we joined CA-17 for Santa Cruz, a highway with which I was familiar. Only now was I happy to pull off for a leg stretch and this we did in Los Gatos. After this I had hoped to find accommodation in Moss Landing, but on making inquiries at the Whole Enchilada, found there was nothing until Castroville. We could not find anything here either and were sent on to Salinas where we spent the night at a Marriott Courtyard. Because we had been looking for accommodation the previous evening we wanted to retrace our steps back through Castroville to a little north of Moss Landing. Having seen artichokes in flower at the Whole Enchilada the previous evening I wanted to stop for pictures. We turned around by blue house which looked a bit like a miniature castle. Having returned this far I was given the opportunity of stopping to view the sea lions which have taken possession of a dock in Moss Landing. “Moss Landing, California, United States is a small community on the shore of Monterey Bay. In April of 2007, the community installed a dock for visitors at a cost of US$800,000. Since then, the new dock has been taken over by hundreds of sea lions which can be seen fighting and playing all around the dock. Harbor officials have tried to make the sea lions leave, but the sea lions seem to like it there. The gangway, which leads to the dock, is closed. A sign reads: "Do not approach. Vicious Sea Lions." By now it was time for a coffee break! Near the coffee shop there was a deli, also a fresh fruit and vegetable market, and we spent some time here before going on to another roadside market. I was able to buy new season almonds here as well as the fresh fruit we were getting for our meals. Then it was on to Carmel-By-The-Sea where we sat on a rock wall overlooking the Pacific for lunch. For the remainder of the day we would be driving the historic coast road clinging to the mountain sides and perched high above precipitous rocky cliffs. It was a very interesting day in that we drove in and out of fog which rolled in off the ocean, and this alternated with periods of sunshine. Some sections of the road passed through redwood forests. Having forgotten to get gas this morning I had to stop for some in Big Sur, the most expensive gas for the whole trip ($5.259/gal) so I only bought $40.00 worth. This area has changed a lot since I was last here, with gift shops and galleries. We stopped in at a bakery hoping to buy bread or a tasty treat, but walked out having bought nothing. Half a loaf of bread was $5.00 and we thought this was just a bit too much! Throughout the afternoon we pull into various overlooks for magnificent views, but particularly enjoyed our visit at Big Sur Coast Gallery Café where we sat out on the patio for coffee and a treat. The Big Sur Coast Gallery Café was renovated this winter, all the better to showcase the spectacular views from our spacious rooftop patio or within the Café. The menu is also newly enhanced, with offerings that celebrate the best seasonally inspired food from California. It was along this highway that Pat finally got a picture of a row of mail boxes, something we had seen a number of times, but had passed them before we realized they were there! When we pulled up for Pat to look for her adaptor to recharge her camera battery, we realized that she had left it at the Marriot when unplugging her camera! 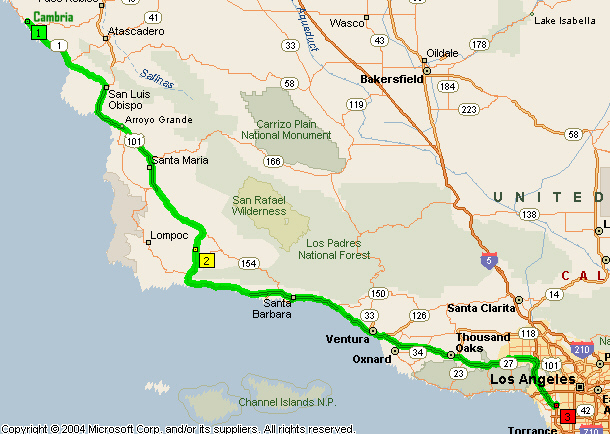 We continued to make brief stops at various pullouts as well as having to slow up or stop for road work. We had a short rest stop at Ragged Point Resort and again at Piedras Blancas Beach north of San Simeon to see the elephant seals. There weren’t as many seals on the beach as I have seen on other occasions. We found a very nice privately owned motel in Cambria, the Blue Bird Inn. After unpacking and settling in I went for a long walk down the main street, but it appeared to be a pretty sleepy little town. I had hoped to find somewhere to get fish and chips, but no such luck! An hour and a half after leaving the Bluebird Inn in Cambria we were looking for somewhere for a rest and coffee, but there were neither Rest Areas nor McDonald’s. We left the highway at Los Alamos but this looked a rather depressed little town and we were soon back on the highway! I took the first exit for Santa Barbara and this proved to be a roundabout way of getting to the seafront near the jetty. Eventually we got a parking spot near the beach in the main city parking lot and it was here that we had our lunch sitting in the car! This was our last stop before arriving at the Best Western Airport Plaza Hotel in Inglewood. We walked from the hotel to a nearby shopping plaza where we had dinner at Friday’s. We walked to the nearby shopping mall for Pat to go shopping, but decide to return to the hotel and take their shuttle to the Fox Hills Mall in Culver City. First we found a coffee stall near the entrance to the mall, then I sat and read the paper for part of the time as I was not interested in traipsing around the stores. For lunch Pat took me to Creme de la Crepe with its traditional French menu. It was very good and we enjoyed a glass of Riesling with our meal, a celebration of the trip we had done together. When we were ready we called for the shuttle to pick us up at the mall to return to the hotel and Pat was able to complete her packing. Around 8 o’clock we took the hotel shuttle to the airport and Pat checked in, but did not have to go through security immediately. We found a restaurant upstairs where we were able to relax over a last meal together, a fitting end to the trip. I left Pat about 10:30 when she would proceed through security and be ready for boarding, and I called for the shuttle to return to the hotel.